As we sit here on the stage absorbing what we’ve just seen, it’s hard to find words to close this day out properly. But we’ll try. It was just after high noon when our November Nine filed onto the stage and into their seats under the bright lights of the made-for-TV set. They were soon engulfed by a crowd of close to 2,000 spectators all decked out in matching shirts, patched up like your grandfather’s trousers, and screaming multi-lingual cheers in unison at full throat. Bruce Buffer soon took the stage to utter the most famous words in poker, and suddenly a poker game broke out amidst all the madness and pomp. It took 28 hands to find our first casualty of the day, and it was the amateur to fall first. Soi Nguyen was content to flip his against Jason Senti’s , but a third queen on the flop was all she wrote for Nguyen. The second victim was also sent packing on a coin flip, albeit an exciting coin flip. 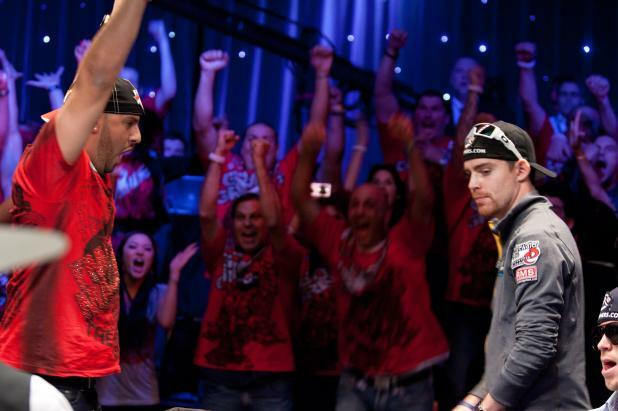 Michael Mizrachi’s loved the flop, but Matthew Jarvis’ liked the turn a little bit better. It looked like he’d just saved his tournament life, but the river gave the pot back to The Grinder and sent Jarvis off in eighth place. 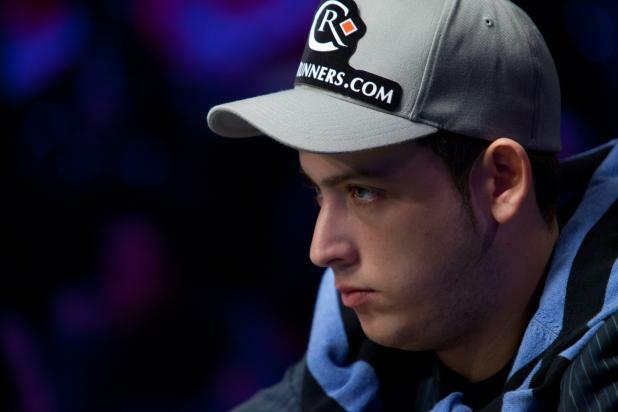 Seven-handed play dragged on for an eternity, and Michael Mizrachi took advantage of the table to build himself a fairly sizable chip lead with more than 60 million. There were still seven when they broke for dinner just before 7pm. When they returned, yet another exciting (and similar) coin flip broke out. Jason Senti’s out-flopped Joseph Cheong’s in a big way as the dealer rolled out . The turn was a little sweat for Senti, and the river was a total disaster. Cheong’s straight pushed his opponent straight out the door, and Senti collected seventh-place money on his way to the bar. John Dolan fell next in sixth place, his unable to win a race (imagine that, a race) against Jonathan Duhamel’s despite turning 16 outs to survive. 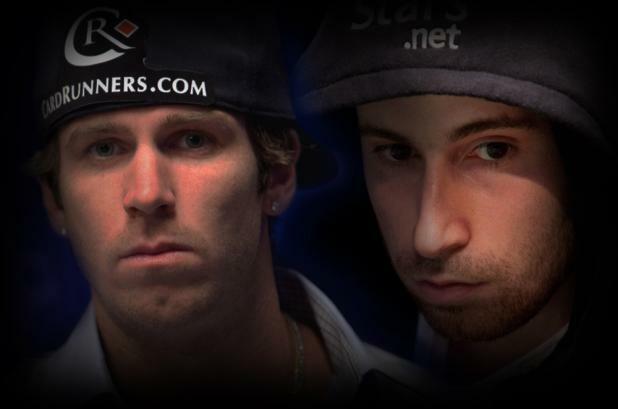 The demise of Michael Mizrachi began when his doubled up John Racener’s to knock him out of the chip lead. A few minutes later, he doubled up Jonathan Duhamel on a big coin flip, and it all came crashing down a few minutes later. Jonathan Duhamel played his slow, and he lured Mizrachi into a shove when his flopped top pair on the . The chips went in, and there was no further help for Mizrachi, ending his near-legendary run in fifth place. That officially gives Frank Kassela the title of 2010 WSOP Player of the Year, incidentally. Three hands later, the volatile Italian (who was surprisingly un-volatile today) fell in fourth place. Filippo Candio got his chips in with , but he could not get there against Joseph Cheong’s . Cheong flopped an ace and made a wheel by the time it was all said and done, and Candio took just over $3 million for his efforts. When they began three-handed play, Cheong and Duhamel were running away with the show. They were each approaching 100 million while John Racener sat patiently by with his 20-ish million. Cheong, however, was in no mood to sit patiently. He went to work quickly and was the first player to crest that magical 100-million-chip mark. He and Duhamel proceeded to wage all-out war hand after dramatic hand while Racener folded his buttons, sat on his hands, and waited for the fireworks. And the fireworks, they came. In Hand #213, 25 hands into the three-way, a battle of the big-stacked blinds broke out. It started with Cheong opening the pot, and the betting action ended with him six-bet shoving all in with . Duhamel probably didn’t like the idea of playing a 180-million-chip pot, but he didn’t waste any time calling with , putting himself at risk in the process. There was no ace for Cheong, and he was crushed from 95 million all the way down to just ten. It was, as far as we can tell, the largest pot in the history of the WSOP! Cheong doubled up once in the meanwhile, but six hands after the blowup, he was gone in third place. That’s good for more than $4 million, but it doesn’t come with a ticket to Monday’s finale. There are only two of those, and they belong to Jonathan Duhamel and John Racener. For handicapping purposes, it’s Duhamel with the big chip lead, but don’t sleep on the short stack. Racener has been playing some fine poker of late, and his short-stack abilities were certainly on display here today. There are 13 minutes, 52 seconds left in the current level, and the button was awarded to the big stack; Jonathan Duhamel will begin with position on Monday. We’re scheduled for an 8pm start here in Las Vegas. It’s Duhamel. It’s Racener. It’s $8.9 million and the 2010 WSOP Main Event gold bracelet. Who ya got? Find out how the final chapter plays out right back here on Monday night. John Racener has the button. 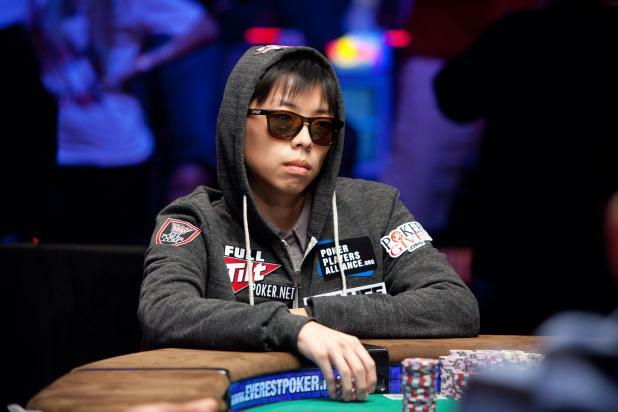 Joseph Cheong raises to 2.9 million from the small blind after Racener folds his button. 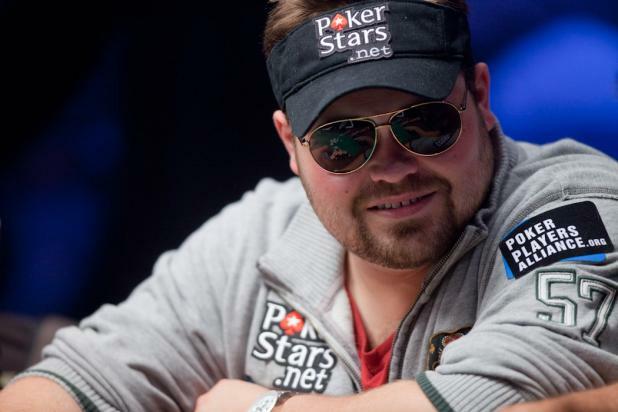 Jonathan Duhamel reraises from the big blind to 6.75 million. Cheong doesn’t buy it and four-bets to 14.25 million. Duhamel comes back with a five-bet to 22.75 million. Cheong goes back and checks his hand while thinking about his decision. The room is completely silent while Cheong tanks. The crowd grows a bit restless after a minute or so, but settles back down before Cheong takes some more time. Cheong moves all in and Duhamel makes the call! The flop is spread, and Cheong still needs to hit while Duhamel stays in front. The turn brings the and everyone in this room in on the edge of their seat awaiting the river card. The river completes the board with the and that’s it! The sea of red Montreal Canadians jerseys swarms Duhamel on the stage and begins the chant of, “Ole! Ole! Ole! Ole! Ole!” Cheong sits back in his chair to assist with the final and official count of the stacks. His cheering section stands stunned, many shaking their heads. Cheong was left with under 10 million in chips. It’s Jonathan Duhamel vs. John Racener! Note: Press Conference with final two players is scheduled for the Rio Masquerade Stage, starting on Sunday at 1:00 pm. Las Vegas, NV (November 7, 2010) — It’s taken four months, two days, and seven hours to reach poker’s ultimate showdown. The crescendo of the November Nine reached its near-final furious finale when Jonathan Duhamel eliminated Jospeh Cheong on what turned out to be the final hand of Final Table — Day One. The last hand was dealt at 1:49 am on Sunday AM. The long 13-hour session included the elimination of seven players, leaving only Duhamel and Racener to compete in a heads-up duel for the world title. Third-place finisher Joseph Cheong, from San Diego, CA collected $4,130,049 in prize money — a nice consolation prize, but a painful exit nonetheless from what was close to a nearly insurmountable chip lead at one point in at the final table. The fourth-place finisher was Filippo Candio, from Sardinia, Italy. As the first Italian player ever to make it to the Main Event Championship final table, Candio proudly collected $3,092,545. The fifth-place finisher was Michael “the Grinder” Mizrachi, from Miami, FL. Undisputedly the most famous and most accomplished of the final nine, Mizrachi suffered a blistering final hour when he went from chip leader to the rail, losing every key late hand of importance. Mizrachi took some consolation in his payout, which amounted to $2332,992 in prize money. The sixth-place finisher was John Dolan, from Bonita Springs, FL. He ran card dead at the worst possible time, hopelessly falling victim to a bad run of cards in the later stages of play. Dolan busted out when his bluff failed. Nonetheless, he managed to scoop a monster-sized check from his initial $10,000 investment. Dolan received $1,772,969 in prize money. The seventh-place finisher was Jason Senti, from St. Louis Park, MN. He began final table play with the shortest stack, but moved two spots up the money ladder. Senti collected $1,356,720. The eighth-place finisher was Matthew Jarvis, who took a terrible beat en route to a disappointing end result. Jarvis was the victim of one of several astounding final table hands which resulted in a cyclone of emotional twists and turns and ultimately, chip lead changes. Jarvis received $1,045,743 in prize money. The ninth-place finisher was Soi Nguyen, from Santa Ana, CA. The only amateur player among the final nine, Nguyen collected $811,823 in prize money — an incredible accomplishment considering this was his first time to cash in a major poker tournament. The final duel of the Main Event is set to begin on Monday night. Heads-up play will resume November 8th at 8 pm PST, when the final two survivors will play down to a winner. Coverage of the final table will air in a two-hour telecast on Tuesday at 10 pm ET on ESPN. The winner of this year’s WSOP Main Event, the second largest in the 40-year history of the WSOP with 7,319 entrants, will take home a staggering $8,944,310 in prize money. He will also be presented with the most coveted achievement in all of poker — the World Series of Poker Main Event Championship gold bracelet. So, who will become the 2010 world poker champion? The duel is set. It’s Jonathan Duhamel versus John Racener. The crescendo of the November Nine reached its near-final furious finale when zig-zagging Duhamel eliminated Cheong on what turned out to be the final hand of Final Table — Day One. The long 14-hour session included the elimination of seven players, leaving only Duhamel and Racener to compete in a heads-up duel for the world title. The third-place finisher was former WSOP Circuit gold ring winner Joseph Cheong, from San Diego, CA. He collected $4,130,049 in prize money, an astronomical consolation prize that still somehow failed to heal the fresh wounds of a poker pro with broken dreams. Making the disappointment more painful, Cheong held the chip lead about an hour before busting out. He lost the key late hands that destroyed what at one point was viewed as a potentially insurmountable advantage. That sets up the heads-up stage of the world championship, coming up on Monday night. It also concluded an extraordinary day (and night) filled with twists and turns, and several exciting moments. The 2010 World Series of Poker Main Event final table — otherwise known as the “November Nine” — has crossed the midway point. There are now more players out on the rail watching and wishing, than still remain seated in poker’s richest game. The latest player to bust out was Italian poker pro Filippo Candio, from the Mediterranean island of Sardinia. He joined fellow finalists Soi Nguyen (9th), Matthew Jarvis (8th), Jason Senti (7th), and John Dolan (6th) as outsiders now looking in – along with a capacity crowd packed inside the Penn and Teller Theater and a worldwide audience following all the action from Las Vegas. Filippo was eliminated when his failed to connect to a final board that showed . Joseph Cheong held and ended up with a straight on the hand.The significance of becoming the first player in Italy to make it to a Main Event final table was not lost on the blossoming new tournament star. The last two hours has included a flurry of action, resulting a huge momentum shift. Joseph Cheong now appears to be the player to beat as play becomes three-handed. Play will continue all night until only two players remain. Last year’s final table (first day) followed a similar pattern and concluded at 5:00 am.Heads-up play will resume on Monday, November 8th at 8 pm PST when the final two will play down to a winner. Coverage of the final table will air in a two-hour telecast on Tuesday at 10 pm ET on ESPN. The winner of this year’s Main Event, the second largest in the 40-year history of the WSOP with 7,319 entrants, will take home $8,944,310 in prize money. He will also be presented with the most coveted achievement in all of poker — the World Series of Poker Main Event Championship gold bracelet. Who will become the 2010 world poker champion? The latest player to walk the plank away from the 2010 World Series of Poker Main Event final table was John Dolan, from Bonita Springs, FL. He received $1,772,959 in prize money. Dolan was short stacked and moved all-in on a bluff attempt. The bold move failed as Jonathan Duhamel called the raise and won what remained of Dolan’s stack, with pocket fours. Table play has been aggressive up to this point. However, cards have fallen in a manner which has produced only four eliminations after ten hours of play (minus 90 minutes taken for the dinner break). Play will continue all night until only two players remain. Last year’s final table (first day) followed a similar pattern and concluded at 5:00 am. Heads-up play will resume on Monday, November 8th at 8 pm PST when the final two will play down to a winner. Coverage of the final table will air in a two-hour telecast on Tuesday at 10 pm ET on ESPN. Who will become the 2010 world poker champion? Keep it here at WSOP.COM for all the latest news, chip counts, and photos from the grand finale to find out. Be sure to tune in to ESPN’s telecast on Tuesday at 10 PM EST, to see how it all unfolded. Another November Nine finalist has been eliminated. Jason Senti, from the Minneapolis-St. Paul area, became the seventh-place finisher in the 2010 World Series of Poker Main Event. He began final table play with the shortest stack among the final nine. Senti managed to survive several all-in situations before finally succumbing to misfortune on what shall certainly be remembered as one of the most electrifying moments at this year’s series. On what turned out to be his final fateful hand, Senti was dealt . He was called (and more than covered) by Joseph Cheong, who showed . Yet another breathtaking roller coaster sequence ensued as Senti caught , giving him a monster hand, trip kings. But things were about to deteriorate rapidly. The on the turn gave Cheong some extra outs with a straight draw. A nine would give him the 30,000,000 pot. For those who had witnessed the unthinkable multiple times before, the mind-boggling river card was perhaps — predictable. It was nonetheless just as exhilarating. The on the river completed Cheong’s straight, leaving Senti in a state of shock. While the entire Penn and Teller Theater went bonkers, Senti and his loyal followers were left with shattered dreams and the cruelest of bad beat stories. Only the promise of collecting seventh-place prize money of $1,356,720 could possibly soften the blow. But to Senti- money was the last thing on his mind. Michael “the Grinder” Mizrachi is the current chip leader. Table play has been quite aggressive up to this point. However, cards have fallen in a manner which produced only three eliminations after nine hours of play (minus 90 minutes taken for the dinner break). Play will continue all night until only two players remain. Last year’s final table (first day) followed a similar pattern and concluded at 5:00 am. Heads-up play will resume on Monday, November 8th at 8 pm PST when the final two will play down to a winner. Coverage of the final table will air in a two-hour telecast on Tuesday at 10 pm ET on ESPN.